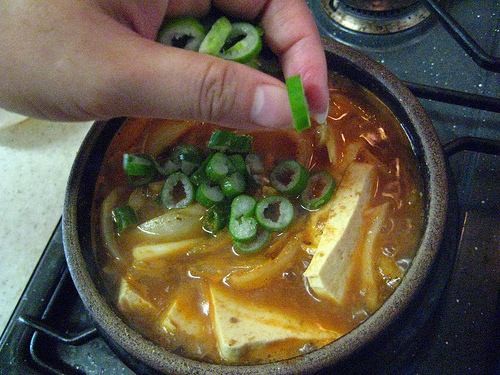 Okay, so you want to know my secrets to making great Doenjang Jjigae at home. I’ve been working on this recipe for a long time, adding this and that. My sister gave me some good tips. The secret, like all cooking, is getting good ingredients. Some may not be easy to find in your area, but try to find them. The big one is this. Joe and I have been trying different Doenjang Pastes for years. We didn’t make Doenjang Jjigae at home until we went to this little restaurant near our house that had yummy Doenjang Jjigae. We raved about it so much that the owner gave us a bag of her specially made Doenjang Paste. We made jjigae at home, and we realized that our Doenjang Jjigaes tasted bad because of bad Doenjang Paste. The restaurant has since closed down, but we have found a Doenjang Paste on the market that tastes a lot like it. It’s from the company Sunchang 순창 and is called “Jogae Myeolchi Jjigae Doenjang,” which means it’s Doenjang Paste with clams and dried anchovies added. I also have a jar of this. In Korea, we call it Migang 미강. It’s basically rice bran. It thickens the stew and gives it body. This may be a hard ingredient to find, so it’s purely optional. I place an earthenware bowl (ddukbaeggi 뚝배기) over the fire, filled with water and a spoonful of ground up dried anchovies. This is my yuksu 육수, or stock. In this recipe I mixed two different Doenjang Pastes, the store-bought one and a homemade one from my mother. I also added a dollop of Gochujang 고추장 (Red Pepper Paste). Mixed it together. Really, you don’t need homemade Doenjang Paste. I just am trying to clean out my refrigerator. That’s one thing Doenjang Jjigae is for. I chopped my vegetables. Onions, chillies, and a few cloves of garlic are necessary, as are green onions. You can also add zucchini, mushrooms or any hearty vegetable. And a good rustic country-style tofu. None of that shiny bland jelly stuff I saw back in Canada. See those pores? Time to throw in my paste mixture. Chillies. And other vegetables, too, if you have them. Stir and return to a boil. Now’s time for the Migang. Joe said it reminded him of using masa flour in thickening chili. Stir. And that’s it. Serve it boiling. Joe says you don’t need beef or any meat in this stew. It’s meaty enough. I don’t know what he means either. Eun Jeong Lee (Research, Attitude) trained really hard to be a lifelong Korean and has achieved phenomenal results. She speaks Korean well and likes kimchi. She also agrees that Korea has four distinct seasons. She’s the magic maker at ZenKimchi, finding and setting stuff up that we thought was not possible and we were told was not possible. I saw these photos on Flickr and have been waiting for the post. The doenjjang looks so gummy. I’m gonna try it but not sure I can get the good paste here. I look forward to more of Eun Jeong’s posts, too. sorry. That should read ‘yummy’! Stupid iPhone auto spellcheck changed it. That should say ‘yummy’ not ‘gummy’. Sorry. I’m starting to learn about cooking Korean food. So 육수 is simply the water mixed with your spices before putting other ingredients? Yuksu is a catchall word for broth and stock. i made this for my future father in law yesterday morning and got a nod of approval and a great compliment before we left the house. thank you for the great recipe and tips!